[Image: The "Phrygian Tomb of Midas, Midas Sehri, 8th century B.C.," photographed by Takeo Kamiya, as if to imply the architectural forms locked inside mountains]. 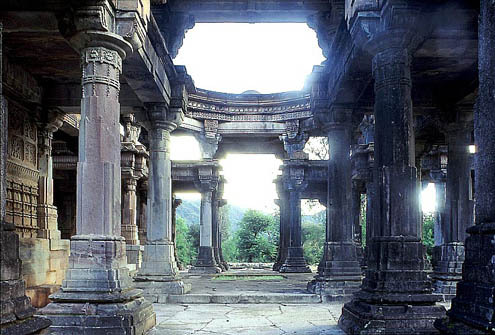 Architect Takeo Kamiya has assembled an amazing collection of his own architectural photographs, taken around the world but focusing primarily on an intensive study of architecture in India. 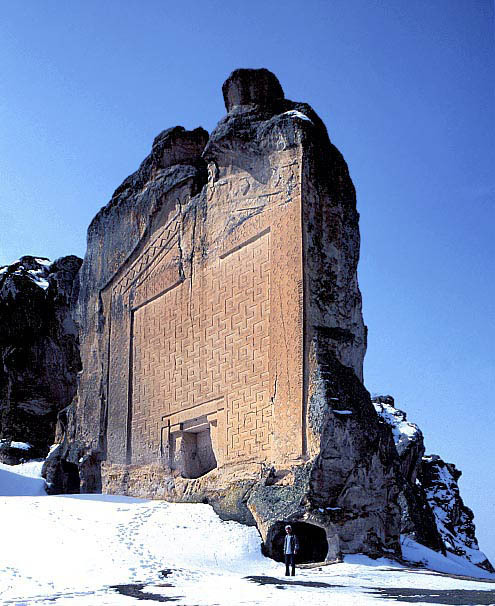 The photos above and below, for instance, show cliff-carved cave temples from ancient Greece and Turkey, structures Kamiya uses as formal comparisons. 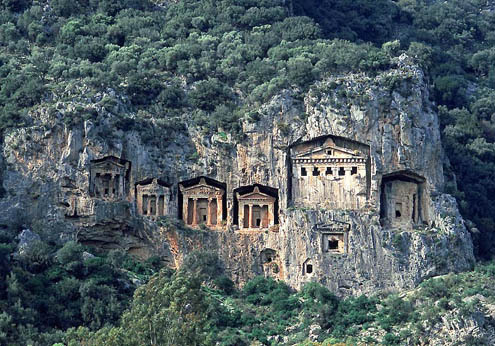 [Image: The "rock tombs of Caria, Kaunos, 4th century B.C.," photographed by Takeo Kamiya]. Available at the site Architecture of India, Kamiya's work remains unpublished elsewhere, he says, due to the malevolent interference of the Japanese mafia. Adding an unexpectedly conspiratorial note to his otherwise brief self-introduction, he writes that "The true reason for that difficulty is the Mafia's pressure on every publishing company [in Japan]. I have been persecuted by the enormous Construction Mafia in Japan for more than ten years. It is not easy to explain briefly to foreigners." Indeed, while "Japan is considered to be a mature democratic country," Kamiya suggests, "actually it is quite the contrary; it is sometimes as terrifying a country as some developing countries." 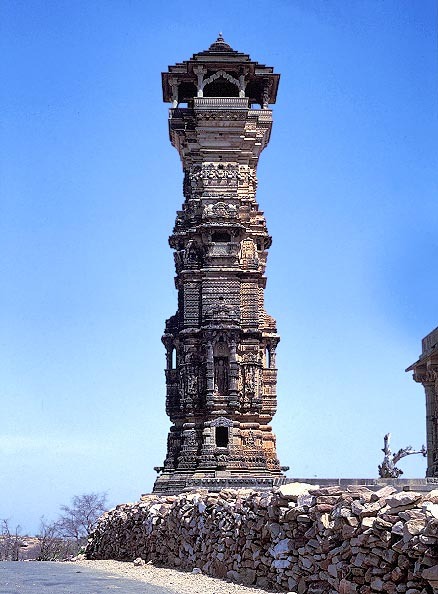 [Image: The 13th century Kirti Stambha at Chitorgarh, photographed by Takeo Kamiya]. The images are fantastic, of course, and, if the architect's evidentially unsubstantiated claims about "mafia interference" actually prove to be true, then I would urge publishers outside Japan to consider putting out at least a small volume of his photographs. I'll include a few here for reference—but I would otherwise strongly suggest taking a long tour through Kamiya's site. Conveniently divided up into chapters, from cave temples in Greece and India to the numerous "temple cities" in the mountains—including the awesome temple city at Mt. Satrunjaya and its individual examples of spatio-optical reverb—the total collection is awe-inspiring. The "Adinatha Temple deep in the mountains" is extraordinary, for instance, as is the Parshvanatha Temple at Varkana, the equally wonderful Parshvanatha Temple at Patan, the cave temples at Ellora (carved directly into the petrified remnants of an ancient lava flow), the strangely Modernist Hemakuta Temples at Hampi, and literally dozens more. I could link for hours. And right when you think you're done, he launches into a study of the wooden temples of Himachal Pradesh (where the 18th century Yogini Temple at Chaini looks like something by Kamiya's fellow countryman Terunobu Fujimori). 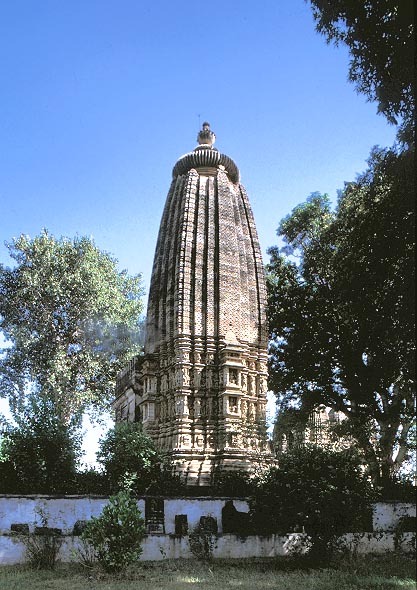 [Image: The abandoned Lakhena Temple at Abhapur, photographed by Takeo Kamiya]. In fact, photos like this (and a hundred others) make me wonder, if Frank Gehry's buildings could be constructed out of brick, would he still be the world's cheesiest architect? 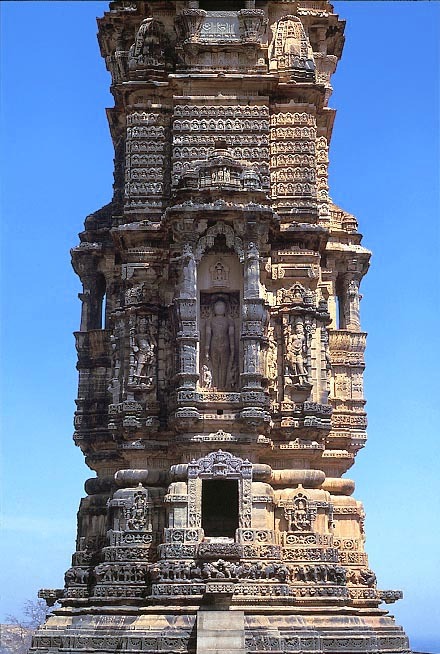 [Image: The exaggerated roof profile of the 11th century Adinatha Temple at Khajuraho, photographed by Takeo Kamiya]. Meanwhile, if Kamiya genuinely can't find a publisher in Japan—for whatever reason—then why not step up and give him a book here in the States (or elsewhere)? Even a small Archipelago Books edition would be amazing. His photos of Jaisalmer alone—for example, here, here, here, and, in full hallucinatory power, here—would justify the cover price. In any case, check out Kamiya's website for more. Thanks for sharing those photos and his story Geoff. I also hope he's able to find a home in print but at least we're able to enjoy them online at this time. These are flat-out amazing. I've seen some very, very elaborate buildings and temples in Nepal, but not quite like this. These are great pics - hope he can find a publisher. He should get in touch with us, we're trying to branch out into books! Kamiya's suggestion of the power of the "Construction Mafia" reminded me of this somewhat sloppy blog post about the construction industry in Japan, which, if nothing else, links to an interesting book. I'm interested in hearing a more specific articulation of what Kamiya is alluding to, though. My guess is maybe he (implicity/explicitly) advocates preservation of sites which might otherwise become profitable building projects? In any case, his work is beautiful; good luck to him! Sweet pics! And amazing architecture! Closest I've seen in person is the Mayan ruins at Chichen Itza, but they aren't even close to these.